The connection between cosmic rays and clouds has long been controversial. Some researchers hold that cosmic rays hitting Earth’s atmosphere create aerosols which, in turn, seed clouds. This could make cosmic rays an important player in weather and climate. Other researchers are less convinced. Although some laboratory experiments support the idea that cosmic rays help seed clouds, skeptics say the effect is too small to substantially affect the cloudiness of our planet or to avert the course of climate change. A new study just published in the Aug. 19th issue of Journal of Geophysical Research: Space Physics comes down in favor of cosmic rays. 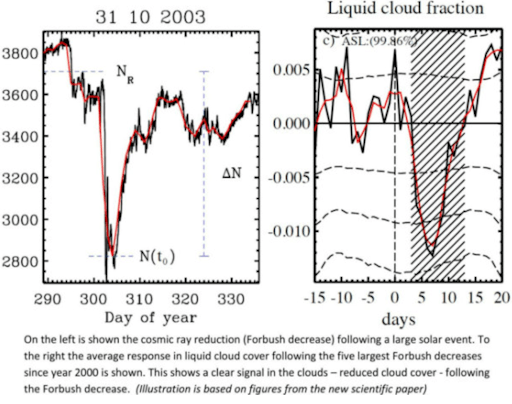 A team of scientists from the Technical University of Denmark (DTU) and the Hebrew University of Jerusalem has linked sudden decreases in cosmic rays (called “Forbush Decreases”) to changes in Earth’s cloud cover. If true, that’s amazing. It would also underscore the importance of measuring cosmic rays in the atmosphere. Recent balloon flights by Spaceweather.com and Earth to Sky Calculus show that cosmic rays are intensifying. Cloudy days, anyone?